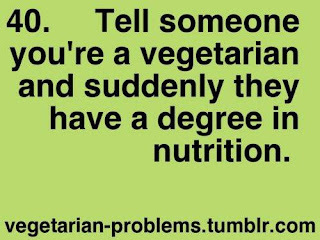 Veggies Rule: Why Are People Scared of Vegetarians/Vegans? Why Are People Scared of Vegetarians/Vegans? This delightful photo came across my desk a little while ago and it sure made me laugh .... oh how true!!! Which leads me to the title of this post "Why are people scared of vegetarians/vegans?" Let's face it, those of us who are constantly having the question "what do you eat for protein?" thrown at us know just how boring that is. It's like - here we go again - and you put a smile on your face and trot out your much used answer (whatever that is). It's been so ingrained in us through excellent marketing strategies by the meat industry that one can't survive without meat protein. Because of that, it's always such an uphill battle convincing meat eaters that, actually, they are having too much protein due to the fact that protein is in so many of the other foods that they are eating. But, getting back to the question in hand about why meat-eaters are "scared" of vegetarians. My opinion is, because of all that ingrained marketing beliefs, they think if they go without meat they will suddenly "fall over" through not eating properly. Another reason for their fear is that they are so used to cooking (or dining out on) meat as the focal point of the dish that they really have no idea just how much more interesting and tasty their food can be if they take the meat out of the equation. Even when I do serve vegetarian or vegan meals to friends, they are fascinated, they enjoy it and they even ask for more ideas on cooking with e.g. lentils (or whatever I've used). However, once home, it's back to what they know - meat first. My usual response is to give them the recipe and encourage them to give it just one try, and if they like it, then to contact me and I'll give them another recipe. It works, but not often. If I can get one person to change one meat meal to vegetarian once a week then it's a start. Oh, and if you want to see just how much more protein meat eaters are having check out this chart - and it's based on only 100g. 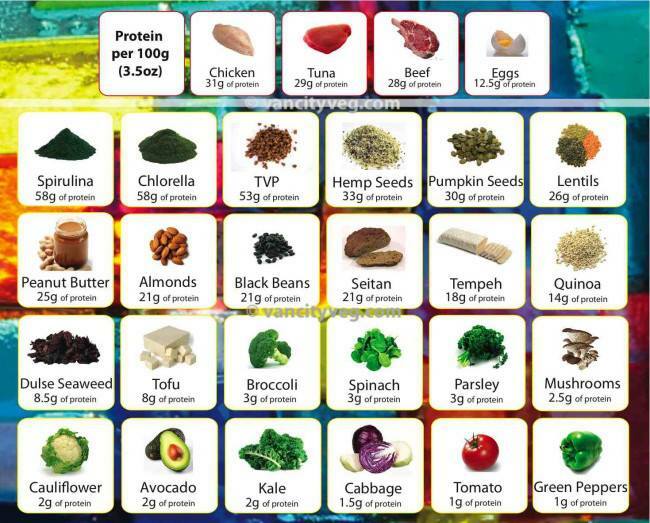 Only some of the many foods that have protein! Just so you know - a person weighing 150 lbs. should eat 55 grams of protein per day. Now, going by the above if some-one of that weight had one egg for breakfast, a peanut butter sandwich for lunch and a 100 gm piece of chicken for dinner - and nothing else - that's 68.5 grams of protein...over the required amount.